BrightSource Energy Solar Electric Generating Facility Avian Assessment - Noreas Inc.
NOREAS supported BrightSource Energy with the design, development and deployment renewable energy technologies across roughly 20,000 acres of southern California desert. 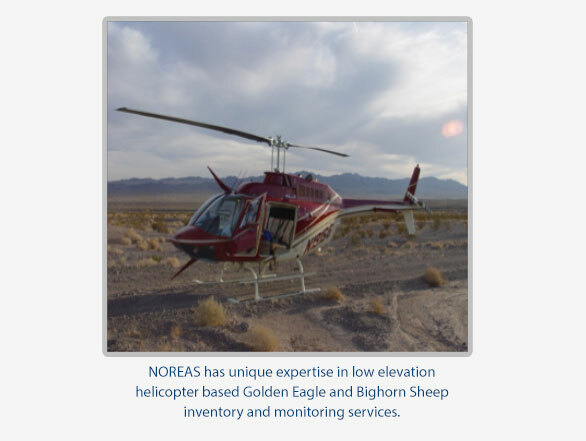 Utilizing our unique expertise in low elevation helicopter-based biological field surveys, NOREAS performed helicopter and ground centered Golden Eagle (Aquila chrysaetos) and Bighorn Sheep (Ovis canadensis nelsoni) inventory and monitoring services within the Mojave Desert of San Bernardino County. Golden Eagle nests, chicks, and eggs in addition to Red-tailed Hawk (Buteo jamaicensis), Peregrine Falcon (Falco peregrinus) and Common Raven (Corvus corax) territories were recorded. NOREAS also documented occupancy and productivity of resident Golden Eagles, including individual nests and territories, throughout Marine Corps Air Ground Combat Center Twenty-nine Palms on BrightSource’s behalf. NOREAS concurrently evaluated, GIS mapped, and monitored migratory and resident species of raptors and passerines, performing weekly avian point count surveys to document species richness, diversity, and abundance near Blythe, California.